The friendly neighbour of Verbier, a quite famous resort Nendaz, caters for skiers and boarders of all ages with a great pleasure and offers easy access to the 4 Valles ski area. This is the place famous for its excellent facilities for beginners and children, for advanced skiers and for off-piste goers, giving the access to some bumpy runs. Nendaz encompasses 400 km of ski pistes and is linked into the Four Valles ski area. There’s a good destination, which won’t break the bank. – Patrick, could you tell us a little about Nendaz, about its location and peculiarities? The 4 VallÉes ski domain is above all the biggest ski domain in Switzerland. It is spread over more than 400 km of ski runs with guaranteed snowfall between 1’350 and 3’330 m – open from December to mid-April. – So, the ski season lasts there almost 5 months? Yes, the season starts the first weekend of December and finish around the 20th of April. You can easily ski to Verbier and Veysonnaz to visit the area. The 4 VallÉes is accessible for intermediate skiers as for good skiers. There is always a cable car to bring you down technical itinerary. Our Premier Alpine Centre ski instructors will guide you in the resort and organize you all you need like restaurants and meeting points. If you are an advanced skier, that technical difficulties don’t scare you and that you are in search of that adrenaline rush, you can discover one of the 6 ski itineraries spread over the 4 VallÉes ski domain. Nendaz is the ideal departure point to make the most of these out-of-the-ordinary ski runs. These non-prepared but secured itineraries are destined to be followed by experienced skiers and should satisfy even the most ambitious winter sports lovers. The 4 VallÉes ski area is well known for the Freeride, we have the Freeride World Tour final in the ski area. Nendaz 4 VallÉes is a freeride paradise. With more than 400 km of slopes, the skiers & snowboarders will be really happy to ride in our ski resort. – What about accommodation facilities? How large and modern are they? The wide selection of accommodation ranges from 1 to 5 star chalets as well as hotels. 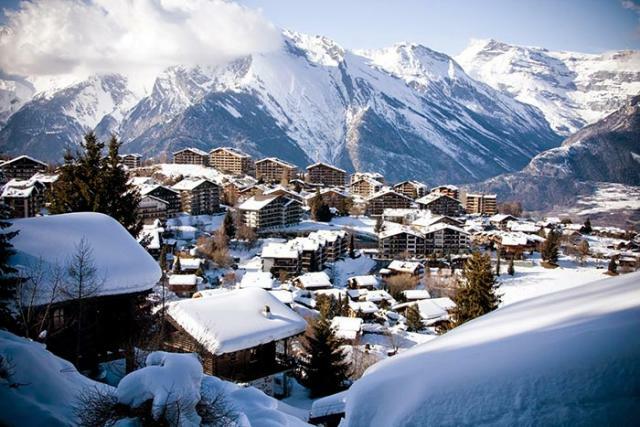 Nendaz offers all type of accommodation, luxury chalets & apartment, hotels, B&B and standard apartments and chalets. Nendaz has a capacity of 400 beds in Hotels and 21’000 beds in chalets & apartments. New from this year is the 4 star superior New Nendaz 4 VallÉes Hotel, located in the heart of the resort. Premier Alpine Centre works close with the 4 star Hotel Nendaz 4VallÉes and Chalet Boutique Etoilesdes Montagnes to offer full range of apartments and chalets and be able to offer full packages included ski & snowboard equipment rental, ski school and ski passes. – Could you name the most popular hotels/ residences/ chalet at the resort? Premier Alpine Centre works in partnership with the Wellness & Spa 4* Hotel Nendaz 4 VallÉes and Chalet Boutique Etoiles des Montagnes. – Will young people find something adventurous and breathtaking there? The 4 VallÉes ski domain is a paradise for all winter sports enthusiasts who can appreciate the powder and ski runs for all abilities. Over 400 km of runs of all levels, 92 lifts, 214 artificial snow making machines will be waiting for everybody who loves skiing. Besides, freeriders will enjoy 6 marked and secured itineraries. A wide range of snowparks in Nendaz, Thyon and Verbier. And also everyone will have an opportunity to enjoy breathtaking views from the summit of the Mont-Fort (3300 m) over more than 20 summits of 4000 m, of which the famous – Mont-Blanc and the Matterhorn. Every traveller will be pleased by a set variety of other activities, which are hosted by Nendaz. There are 100 km of winter walks, 6 snow-shoe hikes, 9 km of cross country ski runs, SPA&Wellnesscenter (2200 sqm), an ice-rink, and also snowtubing, sledge runs, night time ski touring, etc. – What families can find there? The resort is especially appreciated by families who can benefit from numerous advantages such as snow garden, rolling carpets for beginners, ski pass covering only the beginners are, free use of the lift system for children under 7. Besides, the guests are offered weekly entertainments programme (film projections, guided snow-shoe hikes, farm excursion, torchlight descents and so much more). Since 1997 Nendaz has been awarded the «Families Welcome» award. Suisse Tourisme awards this distinction to all resorts that fulfil a certain number of criteria. In Switzerland 23 destinations have been awarded such a label, of which Nendaz is one. Each winter we have more or less 1.60 to 2.5 meters of snow. The Valais & Nendaz is well-known to be the sunniest place in Switzerland. Winters are really great with a lot of snow and almost nice weather guarantee during your stay. Nendaz accommodates tourists coming from all over the world: Belgium, Germany, The Netherlands, France, the UK, Eastern Europe, Scandinavia, Spain, and Russia. – Patrick, how do we get there? From the airports Zurich or Geneva, the easiest way to reach Nendaz is the train via Sion. Premier Alpine Centre offers to their guests to be picked up from Sion train station. From the train station you also have the option to come up to Nendaz with the bus, which provide you nice views over the valley. – Do you have any popular social and sports events? Nendaz organize several top winter and summer events. Hereby some examples. – Waterslide: A beach in the mountains. – National day on the mountain pastures. – What can you say about aprÈs-ski? Edelweiss, Cheers and Le Bob bar are the most popular aprÈs-ski bars in Nendaz. They are located at the bottom of the main slope back to the resort at the end of the day. – If this resort is for everyone whether any special offers exist for ski-pass purchase? Nendaz proposes 2 kinds of ski-passes. «Printse» which covers 200 km of slopes and «4 VallÉes» with more than 400 km off pleasure. We have set up a special promotion in January and in March 2014, which proposes a 30% discount on the ski pass «Printse» and 20% on the accommodation from a 3 nights stay. – Are you improving your lift stations and if are there any innovations and surprises which we can expect from? A cable car between Siviez and the Plan du Fou. A new 8-seater cable car was inaugurated in Siviez on the 20th of December 2013. This brand new lift, built by TÉlÉnendaz, now links Siviez (1730 m) to the Plan du Fou (2430 m), a variation in altitude of 700 m. The trip takes 6 minutes 30 and the cable car has a capacity of 2400 passengers per hour. This project, which cost TÉlÉnendaz nearly 12 million francs has greatly facilitated the liaison between Haute-Nendaz and Siviez/Nendaz, the heart of the 4 VallÉes at the foot of Mont-Fort. In winter, the return to the restaurant from the lake at Tracouet has been made easier thanks to a new rolling carpet. The Tortin chairlift in Siviez has had a facelift this winter 2014/2015. The Tortin chairlift was being equipped for the beginning of the winter season with protective bubbles, what is a true plus with regards to comfort: you are sheltered from the cold and the wind throughout the journey. This lift leaving from Siviez is the doorway towards the Mont-Fort, the highest point of the 4 Valees ski domain, and is very popular with families as it gives direct access to a beginner’s run.